The Eco Stats screen provides estimates of environmental statistics based on the lifetime driving patterns of your car. 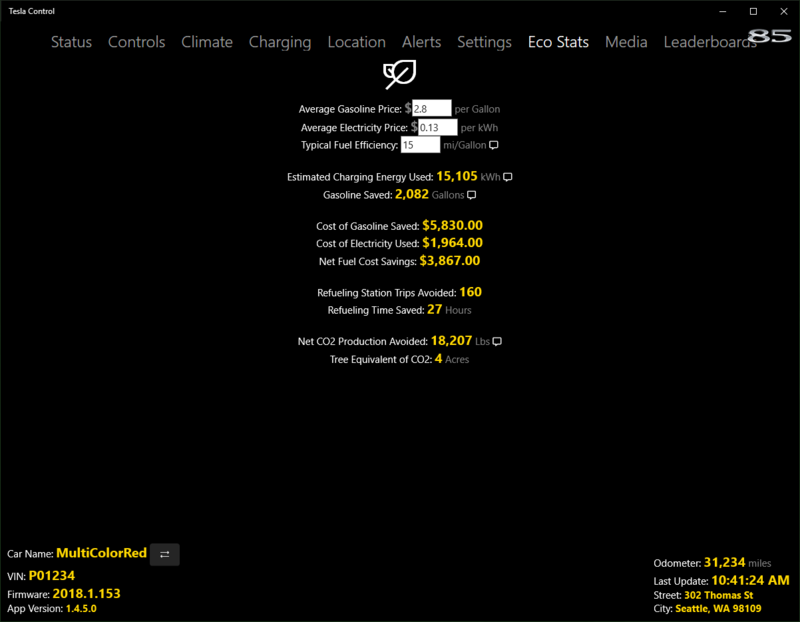 The Eco Stats screen is enabled by purchasing the Environmental Statistics add-on. This and all other available add-ons can be purchased via App Upgrades on the Settings screen. This control allows you to override the default regional fuel price used to calculate the environmental statistics. This control allows you to override the default regional electricity price used to calculate the environmental statistics. This control allows you to override the default fuel efficiency used to calculate the environmental statistics. This is a prediction of the electrical energy used (in KWh) to charge the vehicle over its lifetime. This calculation assumes a 94% charging efficiency. So this value will be larger than reported by the in-car display which considers only net power received. Note: This assumes that all charging took place at home. This is a prediction of how much gasoline would have been burned by a conventional car to travel the same lifetime distance as the current Tesla car. This is a prediction of the cost of the gasoline that would have been burned to travel the same lifetime distance as the current Tesla car. This is a prediction of the cost of the electricity used to charge the vehicle over its lifetime. This is the difference between the cost of gasoline and the cost of electricity. This is a prediction of the number refueling station trips that would be required by a conventional car to travel the same lifetime distance as the current Tesla car. Note: This calculation assumes a 14-gallon (US) fuel tank capacity. This is a prediction of the amount of time that would have been required to refuel a conventional car to travel the same lifetime distance as the current Tesla car. Note: This calculation conservatively assumes an average 10 minutes per refueling. This is a estimation of the net CO2 that would have been generated driving a conventional car the same distance as the current Tesla car. This is an estimation of how many acres (or km2) would be required to offset the net CO2 production avoided.